The liberal agenda is huge in comparison. The left needs to stop laughing and start preparing for the likely Republican presidential nominee, Donald Trump. Trump appeals to voters that the Democrats will need and want in the general election because he speaks to their anxieties, especially around jobs. And even if his campaign implodes, leading to a Democratic blowout, we should be concerned about Trumpism without Trump: the set of economic arguments that will remain part of the political landscape for the foreseeable future. It’s been a difficult 21st century for American workers. Median wages are down 7 percent since 2000, while unemployment has averaged over 6 percent. Trump’s plan is to blame immigration in order to play on the anxieties of white Americans. But this is just a distraction. The effects of immigration, positive and negative, pale in comparison with the more serious issues of mass unemployment and growing inequality, the bread and butter of the new liberal agenda. The differences are striking, and emphasizing them will be a necessary part of the anti-Trumpism strategy. Immigration has a tiny effect on wages—the real threat to workers lies elsewhere. Let’s take immigration, which makes the economy stronger and raises wages overall because, while immigrants take jobs, they also create them. Immigrants afford companies increasing investment and specialization. However, for people who compete with immigrants for jobs, particularly US natives without a high-school diploma, there could be a wage cost. A lot of work has been done on this matter. There are high estimates, associated with the economist George Borjas, that put the cost at 4.7 percent. There are other estimates, associated with Giovanni Peri, that estimate a wage growth of 0.3 percent. Splitting the difference is a 2.2 percent cost to wages for native-born citizens without a high-school diploma. To get a sense of how small this number is, compare it to one of the most straightforward liberal policies: increasing the minimum wage. A higher minimum wage not only increases the earnings of those currently working for less; it also has spillover effects, bolstering the bargaining power of a larger set of workers. Recent research estimates that a 20 percent increase in the minimum wage (to $10.10 in 2018) would increase wages for those at the bottom 10 percent of the income distribution by 2.8 percent—already higher than the costs of immigration. The liberal agenda also includes stronger Wall Street regulations, a more aggressive Federal Reserve, and investing in infrastructure to move us closer to full employment and prevent a new recession. 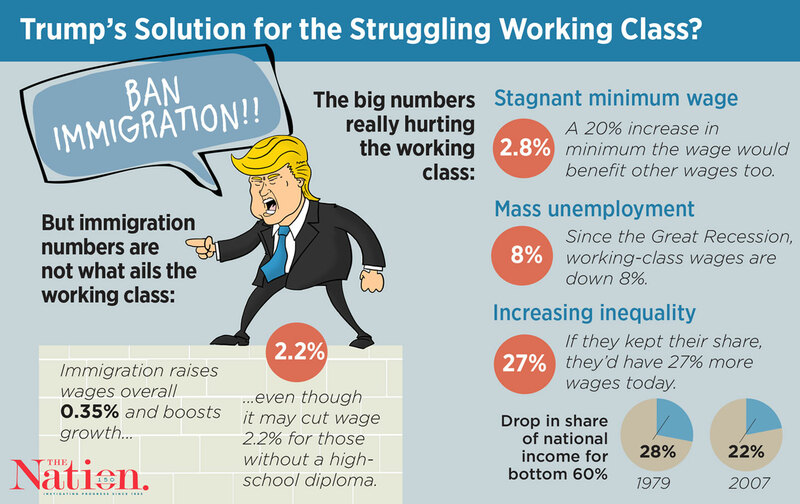 Workers between the 20th and 40th percentile of income saw their wages fall 8 percent between 2007 and 2014 as a result of the Great Recession, making regulation a key working-class priority. More broadly, giveaways to the rich, like corporate-friendly regulations and low marginal tax rates, overwhelm any effects of trade and immigration. The top 1 percent have been taking home a larger slice of the pie since the late 1970s, which means there’s a smaller slice for everyday working people. Those in the bottom 60 percent have dropped from taking home 28 percent of economic gains to 22 percent. Returning to a 1970s distribution would mean a 27 percent increase in income. Conflicts and anxieties over globalization, trade, technology, and immigration go back two centuries in the United States. The left has responded variously with antitrust laws, stronger workers’ rights, progressive taxation, and social insurance. Today, a policy platform of high marginal tax rates, tough financial regulations, and squeezing the costs of healthcare and education would do wonders, and are all widely-agreed-upon planks of the progressive economic agenda. These efforts against economic dislocation form an agenda that Trump, no matter how heterodox his appeal, fundamentally rejects. The proper response to economic hardship is a federal government capable of checking the spread of runaway inequality and guiding our economy toward necessary investments instead of Wall Street rent-seeking. The resulting growth would broaden economic prosperity and lessen anxiety about sharing it with new Americans.